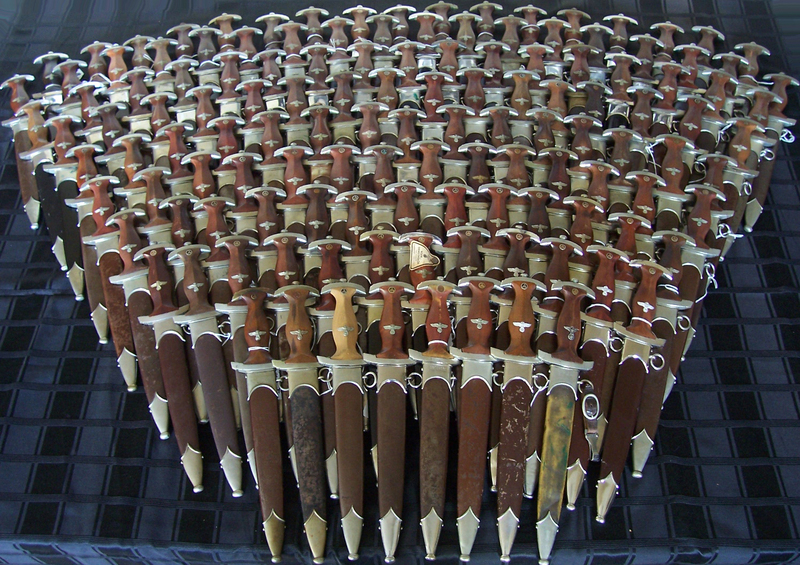 SA dagger collecting is a fascinating hobby however is can be a minefield for the beginner. This article is for the beginner. I am only speaking in generalities here and advanced collectors will have to look elsewhere, however I believe that this hobby has given me so much I would like to give something back in return. Hopefully these pointers can save you a great deal of grief and get you up the learning curve much more quickly. The best advice I can give the beginning collector is to buy their first SA from a trusted source preferably a certified dealer who offers a lifetime warranty as to authenticity and an inspection period-even if it's not from me. This is a very small investment in the hobby. The most common mistake I see is a newbie buying his first dagger from an auction site or at a gun show trying to save a few bucks. I don't know how many times I have seen new collectors throw in the towel after getting taken on their first purchase! Newbies often buy from auction sites, most experienced collectors buy from dealers that alone should say something! When holding a known original in your hand many of things I am going to speak about here will come clear. Much of what I have to say can be applied to SS daggers as well. That's what we collect. EDGED weapons. If the blade is garbage the dagger will never amount to much. First off, look for complete blades. Retipped , sharpened and shortened blades dramatically reduce value and should be avoided. Even nicks and scratches affect value. Dark mottoes are more desirable than light mottoes. Maker marked blades are the most desirable, transitionals (blades having both maker marks and RZM marks) are the second most desirable, and RZM marked blades are the least desirable. Look for crossgraining. Crossgraining is the light lines one sees that run horizontally across the blade. These are a result of the final grind in the factory and are almost impossible to fake. The lower down the blade towards the tip you have crossgrain the better. Though wear and cleaning you lose crossgraining and the loss in my experience, starts at the tip and tends to move up the blade towards the handle. Look at many blades and familiarize yourself with a proper blade. Too much shine indicates polishing or buffing. A buffed blade exhibits a high gloss and very light motto or even a gloss where darkening should be. Crossgraining is removed in the buffing. 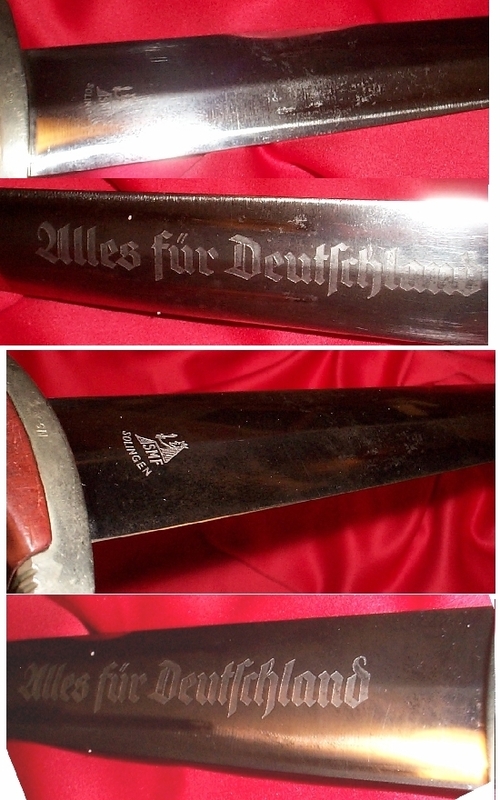 Another thing that is a dead giveaway that a blade has been buffed is to look closely at the motto. Remember that the motto is actually stepped down from the blade. Now think about how the buffing wheel falls down off one side of the "ledge" along the inside of the letter then rubs hard against the other ledge. This can result in a dark edge on one side of the lettering that can appear as a shadow. Hard to see in most pics but when you see it you will know. Keep in mind that people never buff a mint blade. They only buff a blade that's pitted or damaged in some way. If you see some evidence of pitting and the blade is too shiny now you know why! "Graying", as it's called, is a condition that affects many daggers and more often RZM blades in my experience. Graying, looks like splotches on the blade where the steel has lost is reflective qualities and looks more gray than like the bright finish usually seen. This is caused by a change in the steel chemistry over time and is NOT skin deep. I don't know how many times I've read, "just a small bit of pitting will clean right up" or " a bit of graying that will buff out". Folks if it would, "polish or 'buff" right out trust me, the seller would do it themselves! Don't buy a dagger thinking you will be able to clean up the blade. More often than not that is not possible for the average collector. Solid Nickel-Silver crossguards are the most desirable. They stand the test of time and never deteriorate. They will dull and develop a patina but will never lose their integrity. They were the first crossguards made. Typically they are stamped with a "gau" mark. This mark denoted the original issue location. The gau mark is usually found on the back of the dagger above the maker mark. Want to know where your dagger was issued? Each side of the crossguard has 2 deep grooves sometimes these are darkened. Occasionally you will also find these early crossguards stamped on the very bottom (facing the blade) with a small single digit number; this is called a bench number and denotes who originally assembled the dagger. Other markings can be found as well. Serial numbers, unit/brigade markings and even names or dedications can be found. These are so numerous that I can not go into them all in this forum, but more often than not you will see these on these the earliest of crossguards. 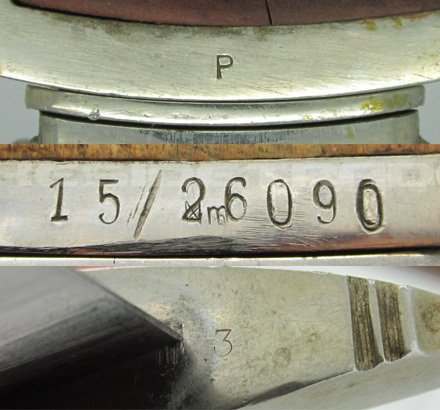 These photos illustrate examples solid nickel guards with: gau marks, an assembly number, and a serialized crossguard. Plated crossguards came out later in the production of daggers as industry was forced to economize on materials. These guards were made from die cast zinc or pot metal. A copper flash was applied, (this allows the final plating to adhere to the base metal) and then a chrome or nickel-plate on top of that. The trouble with plating is that it must be done properly or it will, over time, bubble as the metal underneath corrodes. Today's die casters have this down, but in the 30's this was still an issue. Many plated fittings now display lifting or corrosion. Lifting can be seen as a paper-thin layer of flexible metal raising up off the casting. Underneath that lifting often is seen the corrosion. This plating can also be removed by cleaning and buffing the fittings too much. Keep in mind this plating is only a few tenths thick once it's gone, its' gone. My advice is don't mess with them. Most times these fittings are unmarked on the exterior. 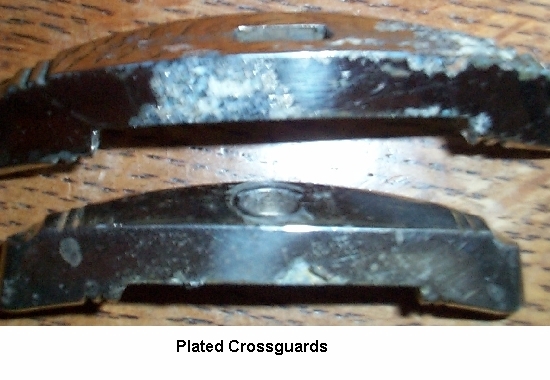 These plated crossguards exhibit deterioration that can be seen on plated parts. Aluminum crossguards were another substitute for the early nickel fittings. These were used later in production. These guards are far lighter than the nickel ones but have the advantage of not having the corrosion or lifting problems of plated fittings. Aluminum tends to oxidize quickly and within weeks of cleaning will revert back to a dull finish. Again typically these are less frequently marked on the exterior. Plated Steel Based crossguards were another substitute for the early nickel fittings. These were used later in production. These guards are far heavier than the nickel ones but have the advantage of not having near the corrosion or lifting problems of plated fittings. Steel against a wood can oxidize as wood absorbs moisture. Again typically these are less frequently marked on the exterior. Other Although rarely encountered, I have also come across a handful of authentic examples of plated, nickel-silver based crossguards. To date I have owned one example of a tombak based plated crossguards. To no surprise, the maker of this dagger was Robert Klaas, Solingen. Look to see if the nut shows scratches or signs of wear. This wear is due to people disassembling, and often, without the proper tools. The more an item in disassembled the more chance it has of being messed with and or damaged. In time the threads wear and have increased chances of being stripped. A pristine nut that has never been turned is a rarity today and desirable. Look for build up of patina on the nut flats this is a good indicator of an unturned nut. Materials vary from nickel, aluminum or plated. The important thing being that the material remains consistent with the rest of the fittings. Rarely would any dagger leave the factory with mismatched fittings, and when you see one it should be viewed with suspicion. As a side bar, don't over tighten your nuts on these daggers. Wood moves. If you do not allow for that movement ,eventually the wood will give. These nuts need not be any more than finger tight. Just ask the SS collector who reefed down on his pommel nut in mid winter only to wake up one humid June morning to see his prize possession chipped! Handles were made from hardwood, never softwood. Makers tended towards some generalities so in time one can see that the handle is typical to that maker. They were roughed out, sanded down, stained, and then the inserts fit with care. Typically early daggers tended to have softer lines than the RZM types indicating more time and care had been taken in finishing. Variations include blonde and tiger striped. Original handles were never made of anything other than wood. A plastic handle is a dead giveaway of a fake. Eagles All eagles were die struck and had two prongs attached to the reverse. They would be hand fit into the recessed machine carved out insert and tooled into place pushing the prongs in the same direction which would allow the eagle to fit perfectly in the grip. Several different base materials were used over time to construct the eagle. We can see solid nickel-silver eagles (early), solid aluminum and silver washed (transitional, late), zinc based and silver washed (late). Occasionally, we will come across an eagle that appears to be constructed out of copper. Prior to the silver wash being added a copper flash (or wash) coating was applied in-between the base metal (which was usually zinc) and the silver wash was then applied. With time, the silver wash had either been absorbed by the copper or simply worn down with time (likely from natural hand oil) revealing the copper coating. To date I have also encountered one tombak based, silver washed example. The earliest examples are anodized. Again these early scabbards are the most desired by collectors. Anodized scabbards exhibit the best workmanship. They came with solid nickel fittings. Over the anodizing is a thin protective lacquer coating. This lacquer often wears off and sometimes loose flakes can be rubbed off even with a soft cloth. Where the lacquer remains you have a shiny finish and where only anodizing exists, it dulls to a matte finish. Many anodized scabbards have lost all their original lacquer finish. As the anodizing wears off, you may see right down to bare metal or rust. The painted scabbard was adopted after the anodized scabbards, I suspect to speed and simplify manufacturing. The first assembled painted scabbards used up the remainder of the solid nickel fittings and very soon after adopted the plated steel based fittings. In the very latest of cases we do come across zinc based plated fittings. Typically the paint was evenly and professionally applied. After drying the scabbard was assembled. 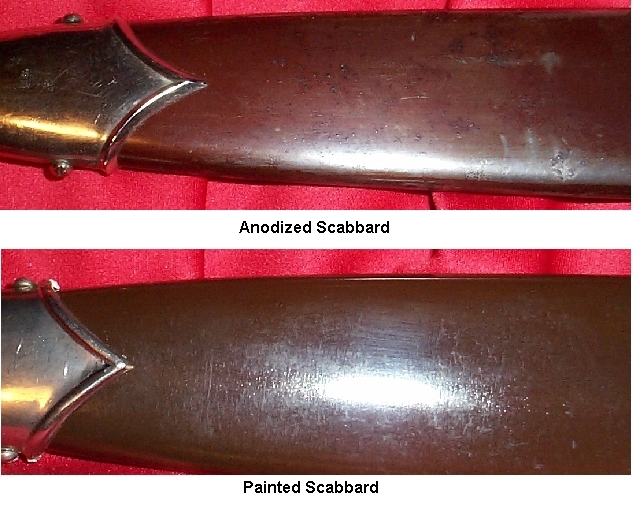 As with the earlier type scabbards, paint wore and chipped off from wear and in some cases the paint is worn down resulting in rust and corrosion. Look closely at the item, dents scratches and splits in the ball all depreciate value. Missing and or buggered screws can be an indication the scabbard was messed with. I always look at the edges of the scabbard fitting. Marks there can indicate that someone has removed the fitting from the shell, often to the detriment of the dagger. Again the scabbard fitting material should be consistent with the crossguard and nut material. If you see mismatched hues from the scabbard to the dagger, look more closely, this may be evidence of switched parts. Below are examples of anodized then painted scabbards. 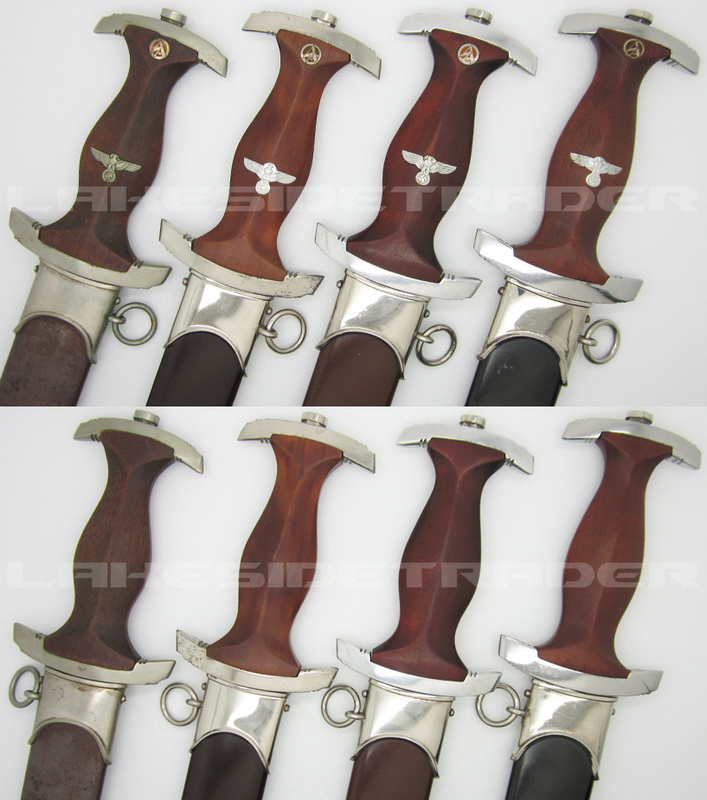 A quick word about NSKK daggers: In 1936 the order came down that NSKK, (logistics or transportation troops) were to differentiate their daggers from SA daggers by wearing black scabbards. After the orders were communicated, NSKK scabbards were repainted black. These guys were not rich and in most cases this was a backyard quality job right over the brown anodized finish. NSKK daggers issued after the 1936 order were factory painted black. A black painted scabbard is the only difference between an SA dagger and NSKK dagger. To most experienced collectors this stuff is obvious, but to me, as a beginning collector, I had to learn this from scratch. These lessons literally cost me hundreds of dollars. What I have to say is to the best of my knowledge. There are exceptions to every rule and every piece you buy has to be evaluated on its' own merit. Most of what I have to say deals with purchasing daggers online. I am located in a rural setting and rarely get the opportunity to buy from dealers in person. Hopefully this can be a starting place for the beginner. Whenever 2 materials are brought together there is natural movement as a result of exposure to time, air, humidity and temperature cycles. Wood tends to shrink over time as compared to metal, which is stable. As a result we see the grips' ends shrinking away from the tips of the crossguard. The wood tends to shrink more with the grain than against the grain. As a result you will often see small gaps (up to 2mm) where the tips of the handle once met the ends of the crossguards. Closer fits are desirable. Gaps of more than 1mm should cause you to look more closely at the dagger. Typically the shrinkage is uniform from side to side so a gap of .5mm on one side and a gap of 2mm on the other side should be a red flag. Variable shrinkage could be caused by a change in the wood grain however the shrinkage typically will not vary by more than 25%. Look closely at any patina between the grip and the guards. Untouched patina is a great indicator a dagger is original. Look closely at the fits. I look to see that the wood surrounding the inlays is smooth. Cracks often have developed over time that run lengthwise perhaps from the roundel up, or at the ends of the eagle. Although not desirable, these are the natural result of time and improper protection against humidity and temperature cycling. Red flags would be chipping around the inlays consistent with someone removing them. These inlays are almost impossible to remove without damaging the adjacent wood. The harder and closer the grain the more susceptible to chipping. The ebony on SS daggers is notorious for chipping. You will see the odd dagger that has been denazified. This was often done by digging at the eagle with a sharp instrument. Evidence of this is easy to detect. I have seen shrinking of the wood push the eagle or part of the eagle out. A wing slightly lifted out from the surface of the wood is sometimes seen and although not desirable can happen. By the way, don't worry, the inlays are pinned in-place and don't fall out easily. Just look closely at the eagle. You will often see wear in the high spots, this is a good indication that it has not been replaced. In use the wearer often held the dagger from moving as can be seen from many period photos. Roundels or insignias vary only slightly from dagger to dagger. I have seen the hue vary however they are all exactly 9mm in diameter. Sometimes the exposed enamel on these will flake off or darken so look close. Again look for a close fit. Seeing light or obvious gaps between the blade and the crossguard is a sign to look closer. Again, I look for patina that is in this area. This can be a sign that the dagger blade is original to the crossguards. Though not always possible, if the dagger can be seen disassembled, does the blade exhibit any signs of recent filing to better fit the crossguard? As a note, I particularly look at this fit in early maker marked daggers. RZM daggers will often display less than perfect fits. A poorly fit blade on early dagger is a red flag. Unfortunately, the blade is the area most susceptible to "trick" photography. The blade can look dramatically different depending on its' angle to the camera. Always look for shots that are straight on to the blade. Angle shots and shots looking down the blade always portray a darker than actual motto. The below photos demonsrate how the same blade can look very different. I really hate seeing these things disassembled and normally pass these pieces. 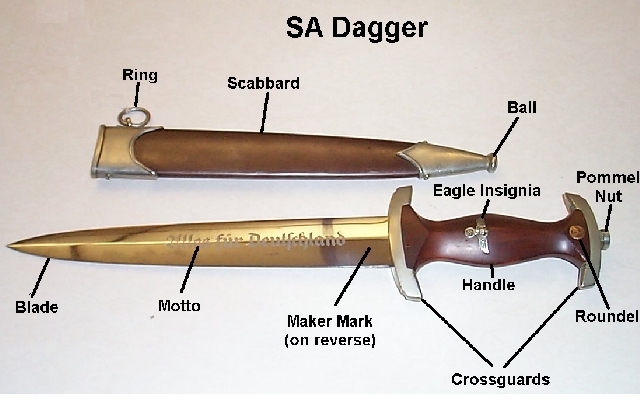 Sellers who take apart daggers are often inexperienced and trying too hard to prove it's real. Disassembly is to the detriment of a dagger. Even if there is no visible damage reassembly often results in chips or cracks down the road. People tend to reef on the nut and the result is chips and cracks as the wood moves over time. If the dagger is disassembled look for billet marks, (small lines up either side of the tang where the blade was squeezed while working it) they should always be present. Buffer pads are small pieces of cloth or leather that are sometimes cut to the oval shape of the scabbard and put between the blade and the lower crossguard. These are another red flag. They tend to cover up poor fits and rarely were used on period SA's or SS daggers. Look closely at the fit of the crossguard to the top or the scabbard. The radii should be the same. If you see larger gaps on the ends than in the center or vise versa, be suspicious. The space between the 2 components should remain consistent. Pictures on left demonstrate good fit and on right evidence of a parts dagger. Look at the dagger hanging from the scabbard ring. It should hang at the correct angle. 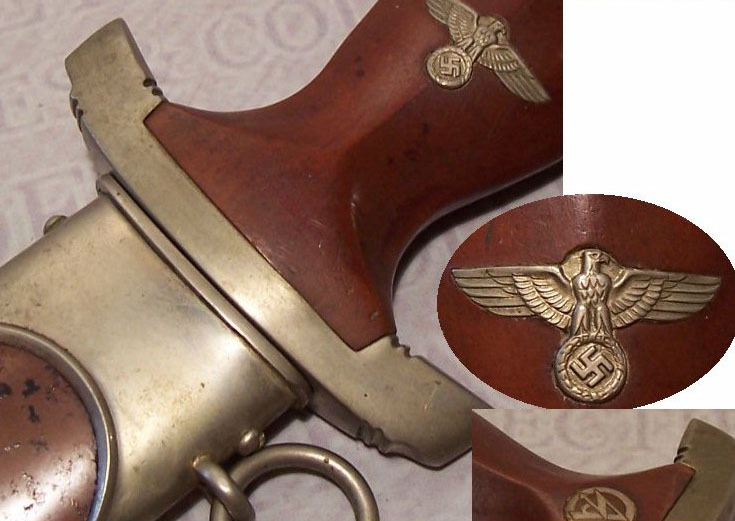 If the angle looks wrong the scabbard could have been replaced or the lead weight could be missing. All wear should be consistent. If the handle is all banged up and the scabbard mint likely the scabbards is not original to the piece. The only exception I've seen to this is a mint blade on an otherwise worn dagger. Perhaps the owner never removed the blade. In the case I'm thinking about, the Vet. left his dagger in and attic for 40 years deteriorating the exterior while leaving the sheathed blade protected from the ravages of time. All I'm saying is that inconsistent wear is a sign to look closer. Maker Marked Daggers: Anodized scabbards nickel fittings and crossguards Gau stamps Highest quality. Good Quality RZM pieces: Plated or Aluminum crossguards-less frequently nickel. Nickel, pot metal or aluminum eagles. Painted scabbards. Poorer fits. Have an RZM SA that you would like to determine the manufacturer of? Here's a list of manufacturers sorted by RZM code. I'm not saying that other configurations don't exist rather I'm saying the above are the most common. Jump on a ridiculously low "Buy it Now" price. - Look before you leap. Ok, I'm ready to buy an SA Dagger!